WHAT are your outstanding competencies? In which areas could the firm be considered best-in-class? WHO is your ideal customer? What types of categories does the firm know best? HOW can your firm be distinguished by the way it thinks? What are your unique philosophies, methods or approaches? WHY is your firm in business in the first place? Beyond making money, what is your purpose? By identifying the key initiatives in each of these areas – and then executing on these initiatives – you bring the agency’s business practices into alignment with the agency positioning. This workshop will show you how. This content is designed for senior professionals in advertising and marketing firms and is particularly appropriate for agency leaders and managers. 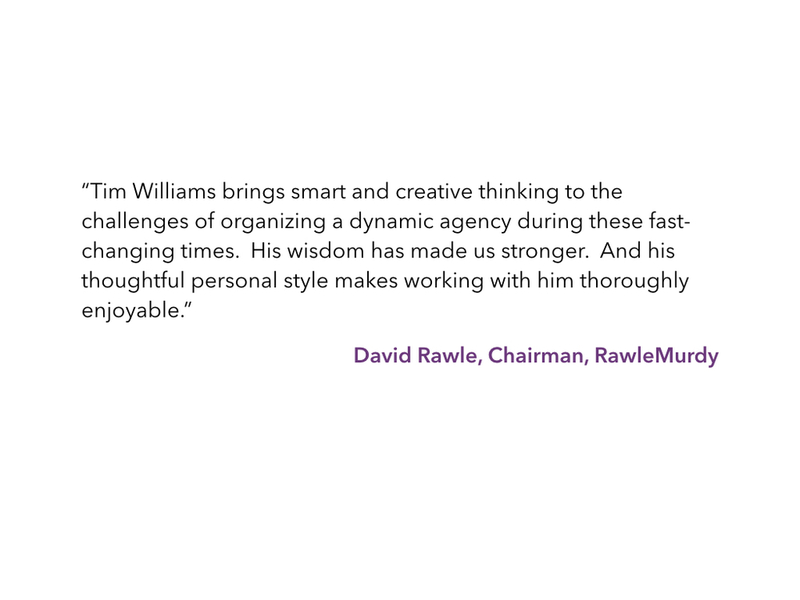 Tim Williams is founder of Ignition Consulting Group, a leading U.S.-based consultancy devoted to helping agencies and other professional firms create and capture more value. Tim is a noted author, international speaker, and presenter for major associations, networks, and business conferences worldwide. He is author of two books on business strategy and has authored numerous articles in leading marketing and business publications. Tim writes the popular blog “Propulsion” and was selected by LinkedIn as a global LinkedIn Influencers in the area of marketing. As a consultant to agencies, law firms, accounting firms and other professional services, Tim has worked with hundreds of firms ranging from mid-size independents to multinational networks in North and South America, Europe, Asia, and Australia. Before forming Ignition, Tim worked at global agencies in New York and elsewhere, and more recently served as president of several successful mid-sized firms in the United States. This topic can be presented as a full-day or half-day event. A webinar version is available as well. For details and pricing, please contact us. Winmo is the leading sales intelligence platform for those targeting national advertisers and their agencies. An evolution of The List Online and AdDataExpress, this new platform empowers new business teams to replace reactive prospecting with effective, proactive business development. Mapping your unique prospecting patterns over time, Winmo connects the dots and serves you with the most timely, relevant sales opportunities in return. TO LEARN MORE, CLICK HERE OR CALL 800-761-1265.